The U.S. Navy is seeking to postpone shock trials for its new nuclear-powered aircraft carrier. The U.S. Navy has requested to delay for at least six years “shock trials” for its nuclear-powered aircraft carrier USS Gerald R. Ford (CVN-78), the lead of ship of the United States’ latest class of carriers, Bloomberg reports this week. In detail, the service is seeking to remove shock trials for the USS Gerald R. Ford from the Navy’s 2019 budget in order to expedite the carrier’s operational deployment. Shock trials are meant to test a carrier’s key systems and assess how well they do under combat conditions. The tests, which have been going on for many decades in the U.S. Navy, involve the detonation of underwater charges. Depending on the outcome of the shock trials, design changes may be necessary prior to a ship assuming initial combat duty. 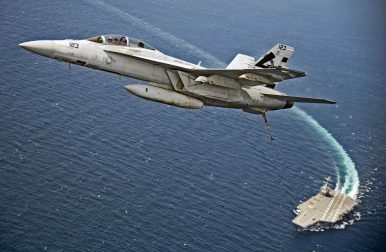 The already overstretched U.S. Navy is concerned that shock testing the carrier may further delay its deployment date. The USS Gerald R. Ford, commissioned in July 2017, is equipped with a host of new and untested technologies, including the carrier’s two main turbine generators, a new dual-band radar system, advanced weapons elevators, and a new advanced arresting gear on the flight deck. (U.S. President Donald Trump objected to the installation of some of the new systems such as General Dynamics’ new electromagnetic aircraft launch system aboard, as I reported in May 2017. )It is precisely the reliability of these new systems that the Pentagon’s wants to thoroughly test. Yet, instead of shock testing the USS Gerald R. Ford, the U.S. Navy has proposed to conduct shock trials on the Ford’s follow-on, the future John F. Kennedy, likely be launched with a two-year delay in 2020. It is now up to U.S. Defense Secretary James Mattis to make a final decision on the subject. As I reported last year, cancellation of the show trials might speed up the deployment of the new carrier by a year. (The Ford is scheduled for its first combat deployment in 2022.) “By taking out the shock trial associated with CVN-78, we are at least able to accelerate the Ford delivery by at least a year,” a congressional aide to the House Armed Services Committee’s Seapower (HASC) and Projection Forces Subcommittee said in June 2017. The U.S. Navy’s newest aircraft carrier began a post-availability shakedown period on July 15.